Duterte has previously threatened China with sending soldiers on "suicide missions" if Beijing undertakes any hostile actions against the Philippine island of Pag-asa, which has recently seen an increased Chinese military presence around it. Spokesman for the Philippine president Salvador Panelo has called on Beijing to avoid carrying out acts endangering Philippine fishermen in the disputed waters of the South China Sea and that would "cause irritants" that threaten the positive trend in relations between the Philippines and China. His comments came in light of Chinese warnings to "non-littoral states" that are active in the disputed sea against "stirring up trouble" days after US naval ships participated in joint drills alongside Manila's forces. As part of the drills, the sides practised operations aimed at recapturing small islands seized by a hypothetical foreign military force. During the exercises, the US also tested a new application for its amphibious assault ships after one of them was redesigned to serve as a small aircraft carrier with 10 F-35B jets on board. 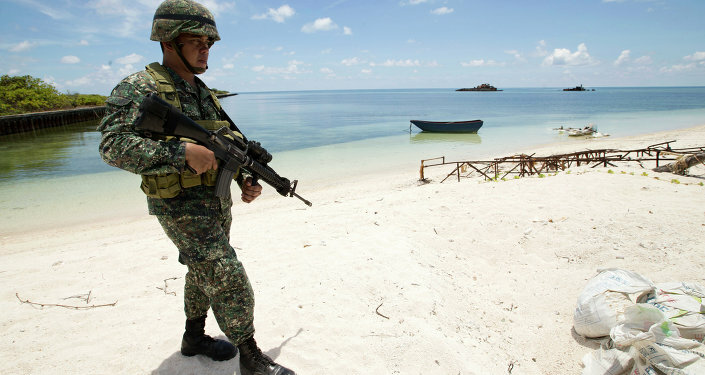 Previously, Philippine President Rodrigo Duterte cautioned Beijing against taking hostile actions against Pag-asa Island after around 100 Chinese vessels were spotted around it. Duterte admitted that military actions against Beijing would likely be disastrous for his country, but added that he would still order his soldiers to "prepare for suicide missions". Numerous states claim sovereignty over the islands and islets in the South China Sea, including China, the Philippines, Brunei, Malaysia, Taiwan, and Vietnam. Among them, China has the greatest presence in the region. The US, despite claiming no rights to the territories in the region, is also actively engaged in the dispute, sending its warships to the sea, something which has sparked harsh criticism from Beijing, which calls such moves "provocations".